I’m back with another "Checking it Out" post where I go to restaurants and tell you about my experience. In case you missed it, my first one, it was on the Antique Sandwich Company. This time we headed to Red Elm. I feel like this place did a good job marketing to families because most of my mom friends associate this place as a kid-friendly cafe. It opened in spring 2017, and we’ve been a couple of times. I would say our latest visit was our best experience yet. Here are the deets. The cafe is over in the Hilltop neighborhood at 1114 Mlk Jr Way, Tacoma, WA 98405. 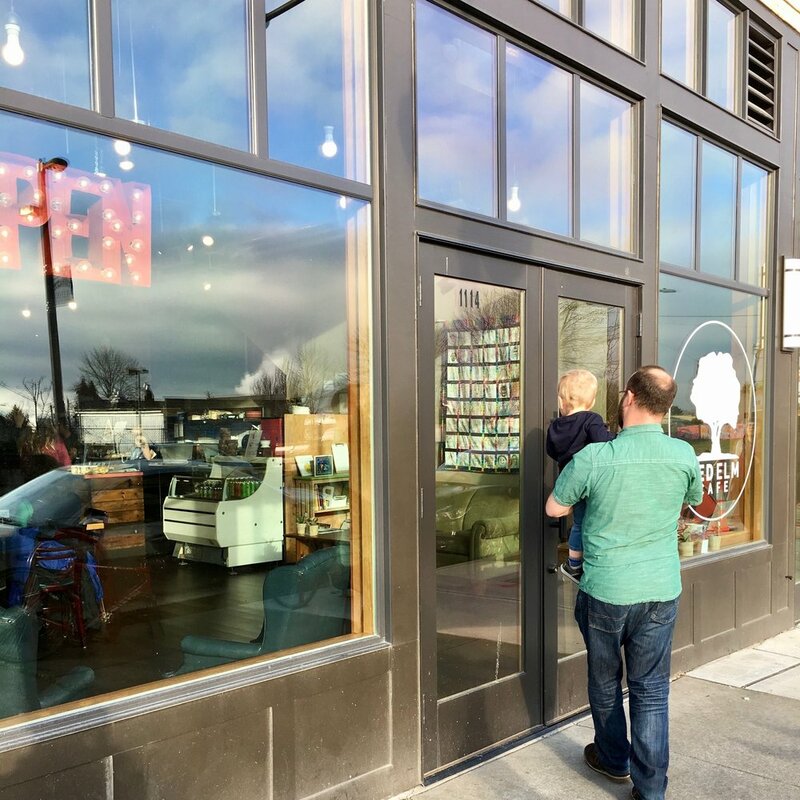 We only come to this area for a few things - Red Elm, Manifesto Coffee, and 1022 South J - all which are within a two block radius of each other. Looking on a map, I can tell you it’s between People’s Park and St Joesph’s Hospital. I believe this area can be sketchy at times, but we haven’t had an issue. Plus, I would feel comfortable going here on my own with Caleb in the daytime. This is a lovely little cafe. I’m not going to run around yelling it's praises, but we leave happy and full. The atmosphere here is welcoming and laid-back with a friendly staff and happy customers. The space is clean and open with high ceilings, brick walls, wood counters, chalk menu, and hardwood floors. Couches, local art, and books shelves all bring in the relaxed feel as well. I also enjoy that even though the cafe is very narrow, there is plenty of natural light shining in from the front windows. I’ll get more into the food and beverages further down, but the food is decent. It’s the type of cafe where you order at the register, and then they bring the food to your table which adds to the casual feel of the cafe. I appreciate that the cafe owners trying to be part of the community and be a kid-friendly gathering place. This fact makes me want to support the business even more. As I mentioned, the food here is decent. I’d say the main issue with it, is that the menu is pretty limited. You find waffles, breakfast and lunch sandwiches, avocado toast, and a few other miscellaneous items. The first time we went, there was an egg waffle (aka womelette) on the menu, but that seems to be gone now. However, the cafe does appear to use the egg waffle on their breakfast egg sandwiches. They use the waffle iron to make the eggs for the sandwich, but I feel like it makes the eggs spongy. Paired with regular sandwich bread creates nothing special. When I took a bite of Josh’s waffle, I realized I should be ordering that moving forward. And so I have. There are three kinds of waffles: Belgian, bacon cheddar, and pesto feta along with a vegan/GF option. The avocado toast is okay. Honestly, it’s been a while since I ordered it, but it was too smooth for my liking. I like it more smashed with some pieces of avocado still intact. My impression is that it was blended at the start of the day and not made to order. I could be entirely wrong, but that’s what the texture makes me think. The bread is sandwich style, and I prefer my toast rustic, crusty, and chewy. So again, I say get the waffle. We’ve tried the turkey sausage stacks, and they were just as described. Turkey sausages stacked with cheese and spinach. I wouldn’t order it again unless this is exactly what you are wanting. Josh has tried the waffle dog and waffle mozzarella on past visits, which I think kids would find fun. We haven’t had their lunch sandwiches, so no comment there. Now onto the beverages...and by beverages I mean coffee. That’s really the only important thing in the morning, right? They have improved on their coffee each time we’ve visited. Of the three tiers of coffee places, this would be in the middle. The top tier is Tacoma trifecta (as determined by the coffee snobs that we are) - Vahalla, Blue Beard, and Manifesto. The bottom tier would be places like McDonald's. So, this falls in the middle. It’s not a coffee destination, but if you go then the coffee is good. My usual is a sugar-free vanilla, 2% latte and Josh’s is a mocha. Both were tasty, and we nodded our approval. Lastly, the price. The prices here are actually rather reasonable. I think we managed breakfast for about $20 - two waffles and two coffees - and we left full. I appreciate this when sometimes you get breakfast it’s more like $30+, and you leave wondering how that happened. Good news, it’s a very kid-friendly place. Let’s be real here though; this isn’t a play space with a cafe; it’s a cafe with a play space. However, they are very accommodating to kids. There is a nook in the far back of the cafe with a small kids play area. 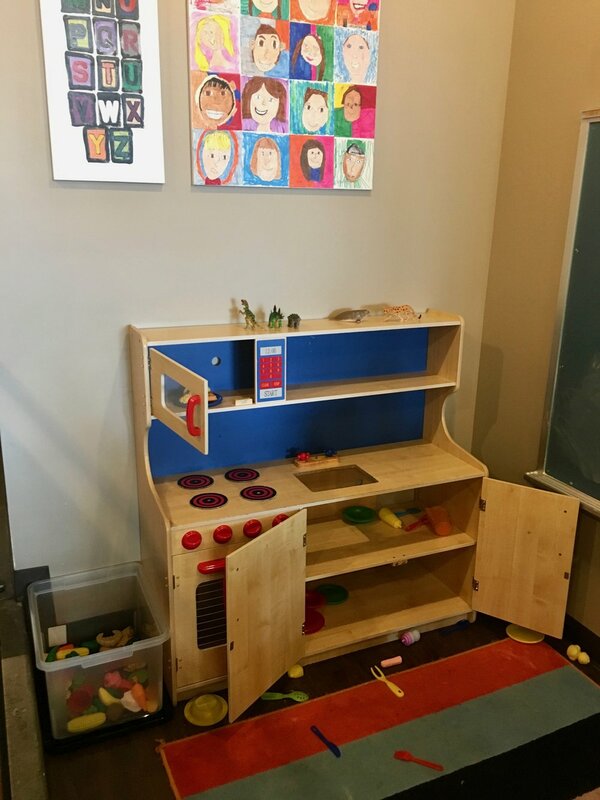 The play area has a large chalkboard, a kitchen with pretend food, and kid-sized chairs. There is a colorful rug and everything seems to be kept relatively clean. As for parents watching the kids in the play area, it would be beneficial if they could fit more tables near the play area so watching your kids while eating or drinking was easier. However, the narrow shape of the cafe doesn’t make that possible. Also, the kid's space is not huge, so only a few kids can comfortably play. Luckily, of the times we’ve been, this hasn't been an issue. On our last visit, there a mom was sitting in the kids area and blocking the entrance a tad, so that could be an issue. I guess where I want to warn you that it’s small. Another positive kid-friendly note is that I felt that the customers were all very accepting of the kids in the cafe. When we were there, Caleb decided to be Mr. Fussy-pants and didn’t want to play in the kid's area and was being somewhat noisy. The ladies next to us were amiable and joked with Josh and I about it. I think customers come to the cafe knowing it’s a nice spot for families to bring their little ones. In addition, the food seems to be something kids would enjoy. Even my picky eater even went in for a bite of waffle. And I feel like kids would be all over a waffle dog or waffled mozzarella stick. If not, there is the classic grilled cheese available. There is also a pastry case with some muffins, scones, and cookies that kids may enjoy for a snack. While the menu is short, we do enjoy our experiences here. If they added just a few more things to the menu, and if it were a wee bit closer to home, then this place would be rocking. I get good vibes here and feel comfortable knowing we can bring a Mr. Fussy-pants and we won’t get evil stares. In fact, maybe it’ll even snap him out of it with the play area or interaction with other kids. Oh, I should also mention it wasn’t crazy crowded on a Saturday morning. We were able to grab a table without a problem - one near the kid's area no less. The food came reasonably fast and delivered to our table with a smile. Lastly, if you ever need something of this sort, they have a community meeting room in towards the back that you could rent for meetings or events. I won’t say it’s a place for a kid’s birthday, but it would be an excellent place for a book club or other community type meet-ups. For instance, when we were there, a toastmasters event was in progress. It has a door, so there was no disturbance between the cafe and the room. I would recommend checking this place out yourself if you are looking to have breakfast out or want coffee with another mom (or caregiver) friend. If you go, tell me what you think! Do they have High Chairs? Yes, and they have at least three, so you should be able to snag one. Can I bring my Stroller in? Yes, it is big enough inside for you to roll on in.